Valve had a CES event tonight, and though there was neither hide nor hair of a finished official Steam Box, Steam controllers were on hand for the trying and man they are weird. But in a way that makes me hopeful. The first thing you'll notice when you hold a Steam controller is the way it sort of reaches out towards you. Instead of handles that curve away like on an Xbox One or PS4 controller (both of which are great, it's worth noting) the handles on a Steam controller are almost reaching out to hug you. And despite that weirdness, they fit in my palms just fine. The trigger situation is a bit strange: instead of just a standard L1/L2 situation, the Steam controller has additional "triggers" that reach out along the underside of its handles, where your hands always are. Great for easy access, but the six pairs are a little crowded, so you don't have perfect access to all three of them at the same time with the same hand configuration. You're always good to use at least two though. And lastly there are the trackpads and they are something else. The haptic vibrations that rumble underneath the surface do a lot to add to a sense that you are interacting with something physical, tactile. It's nothing like using a joystick, but it's a little like using a trackball. But only a little. Those vibrations add to the tactile sense, but they don't make it feel real. It feels very much like using a good trackball emulator or something. Swipe your thumb across a pad real fast and you'll feel the clicks continue to ripple across the surface as if the "ball" was still "rolling" and you'll think "oh man it's cool that this knows how to fake that." Which it is. When it comes to playing games, acclimating is hard. I played a little Starbound and Portal 2 and they were very different experiences. Portal 2 felt almost normal, the way the trackpads feel almost physical. Playing shooters on a Steam controller as opposed to a real controller feels like a matter of acclimation. In Starbound it was easy enough to move the character around and traversing menu's and other mouse-y tasks are way better with a pad than with a stick. But! The task of figuring out how mouse and keyboard map to the controls is not trivial. That's both "duh," promising, and a problem. And you can always look them up if you have to. The Steam controllers greatest strength lies in potentially converting mouse and keyboard heavy games to couch-fare. But at least half of that burden lays on players who must actively acclimate, and developers (or other folks) who develop and put out good maps. It's gonna be interesting. Like the controllers and Steam Boxes that are already out there, these were prototype units, so no touchscreen in the middle, just physical buttons. But otherwise, this seems like it'll be pretty close to the real thing, and although you may not want to jump at the chance to throw out all your old controllers, it's a curiosity worth checking out if you ever get the chance. 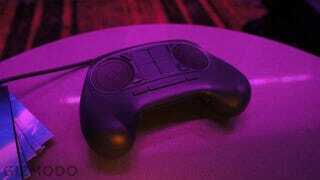 Gabe Newell said Valve will be selling Steam controllers separately (though he did not say when or for how much) so there will be a way to dip your toe in the water. Although if this really is the future, there'll be no avoiding it.